Welcome to our new series, ‘CareLink Stories’. Here we sit down and speak to clients who use our CareLink service, whether it be for telephone befriending calls, home visits, community activities or day trips to local attractions. In our first instalment, Joyce, who lives just outside of Burslem, tells us about how she’s been finding CareLink since becoming one of our clients. Carelink will soon be launching our new and expanded service. 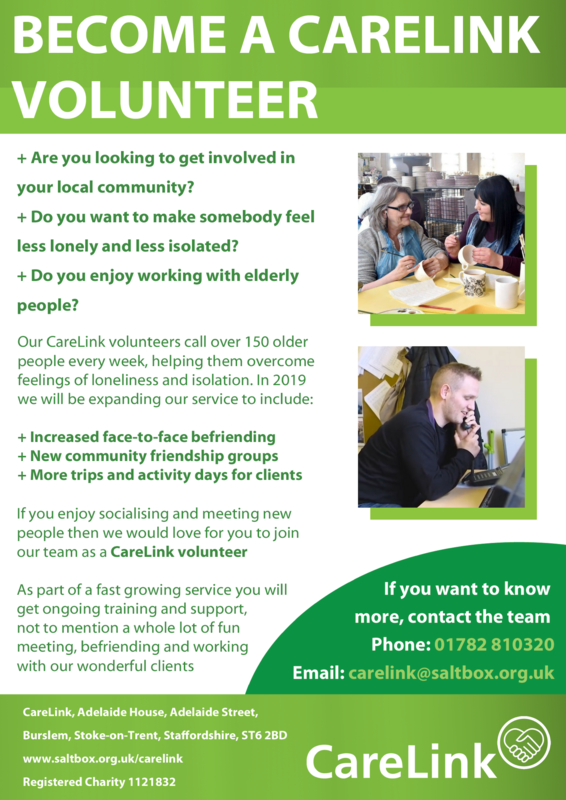 This will incorporate the existing service, which already offers telephone befriending and crisis aversion support, with the primary objective of reducing loneliness and isolation, and building connections amongst vulnerable people over the age of 60. Our first phase will be recruiting volunteers to help support these new opportunities in taking shape. To find out more information, please email: christinem@saltbox.org.uk or mandy@saltbox.org.uk. Alternatively telephone 01782 810320 ext 2. Our CareLink volunteers enjoyed a well deserved Christmas Party last week. Saltbox would like to say thank you for all of the hard work, time and dedication our volunteers give towards supporting elderly, lonely and isolated people across Stoke-on-Trent. A short video of the afternoon can be viewed below. Last week our CareLink clients enjoyed a trip to Belong Villages in Newcastle-under-Lyme. Formerly the location of Maxims night club, the site has been transformed in recent years to include residential, nursing and bistro facilities alongside a local heritage gallery. A big thank you to the staff who looked after us and put on a delicious early festive meal. We filmed a short video of the day which you can watch below. 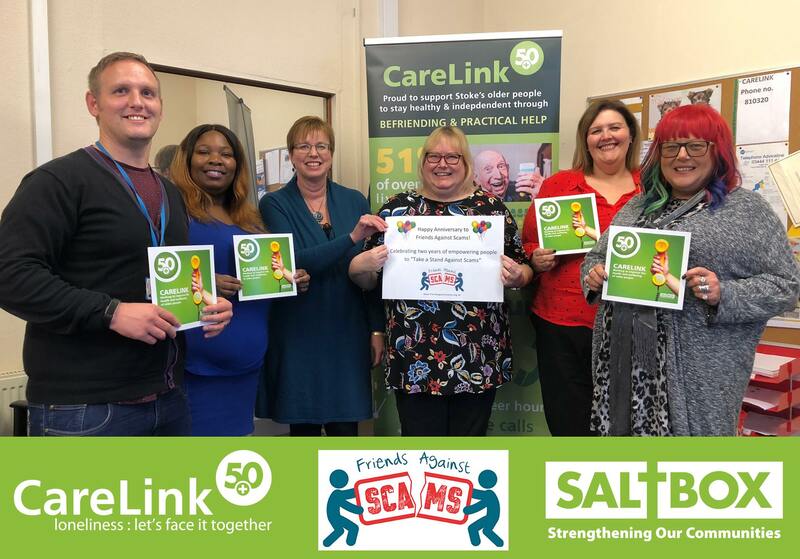 Our CareLink team is proud to support the Friends Against Scams initiative. Scams against the elderly, isolated and vulnerable are especially common. 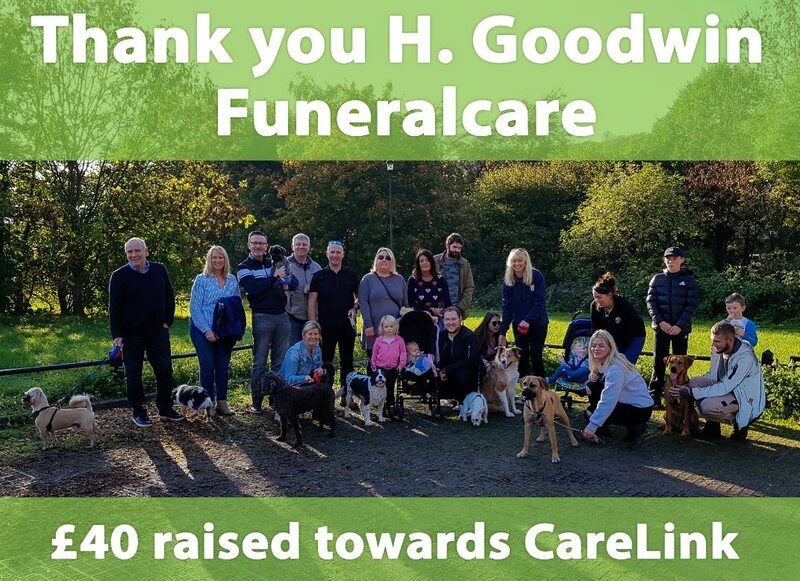 CareLink would like to say thank you to H. Goodwin Funeralcare, based in Newcastle-under-Lyme. On 21 October, they held a walk in the park event which raised £40.00 towards our CareLink service. We would like to say a big thank you to ‘Smokey Bob’ and 6 Towns Radio who featured Saltbox’s CareLink service on their ‘Charity Matters’ segment earlier in the week. Our very own Linda and Nikki spoke about who we are, what we do and how people from Stoke-on-Trent can get involved with our over-50s befriending service. We’re very proud to see our CareLink service represented in FaithAction’s Faith & Health Awards 2018. Our elderly befriending service, which has spent the past ten years tackling loneliness and isolation across Stoke-on-Trent, was one of two charities featured in the ‘Highly Commended’ section of the awards. FaithAction aims to shine a light on the best work undertaken by UK faith groups, in particular where faith-based organisations strive to keep individuals in good health while taking pressure off the NHS. The overall 2018 winner was Hear Here! – Hearing Champions, a partnership between four hospital audiology departments and churches in Surrey and NE Hampshire. Local NHS staff work and train church volunteers to understand hearing impairment and basic hearing aid maintenance, allowing them to offer drop-in clinics in their local communities. The 2018 Runners-up consisted of NOAH Welfare Centre, a Luton-based drop-in service for people who are homeless or vulnerably housed, and Purple Room Cafe – The Fed, who provide social care and support to the Manchester Jewish Community through a range of services and initiatives. Our very own CareLink was next up, featuring in the Highly Commended category alongside The Dairy House Elim Connect Centre, a hostel for rough sleepers in the Mendip area. 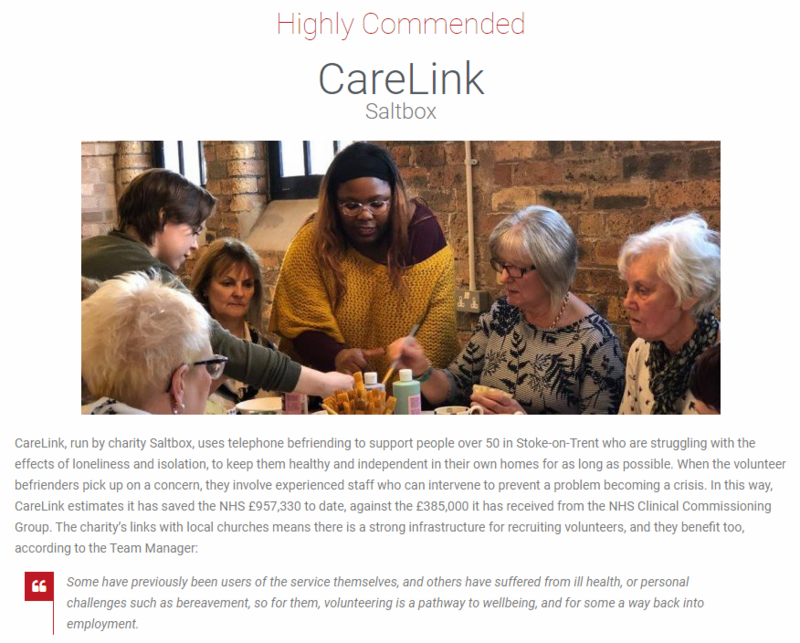 Saltbox would like to say a big well done to all organisations involved and thank them for their work in supporting the NHS and improving health and wellbeing across UK communities. 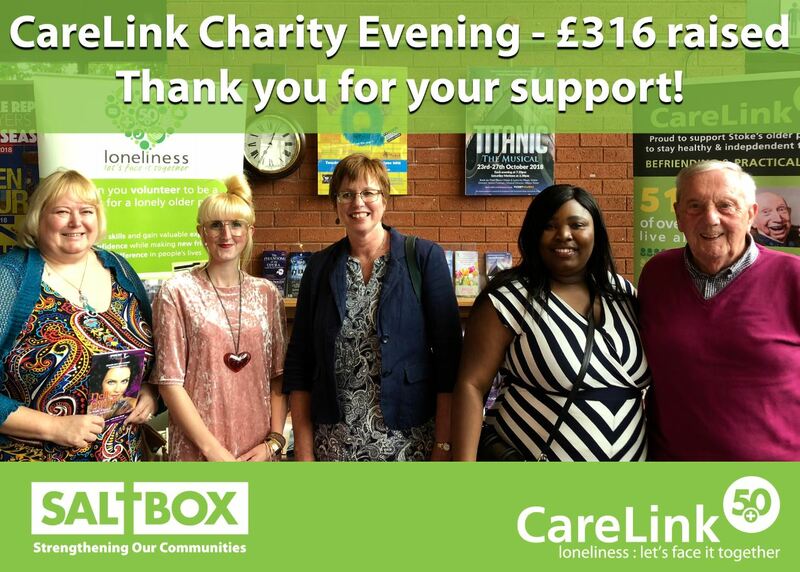 On Wednesday 13 June 2018, we held our CareLink Charity Evening at the Stoke-on-Trent Repertory Theatre. The evening consisted of a production of the play, ‘Nell Gwynn’, and a charity prize raffle. The event was a fantastic success and raised £316 towards our CareLink service. We’d like to say thank you to the Rep Theatre for hosting us and also donating £5 from every ticket sold to our cause. Also, a huge thank you to all who donated prizes towards our raffle. To us, £316 means that we can fund 2870 calls to find out how our elderly clients are faring, taking an interest in their welfare, helping them with day-to-day concerns or health issues, and especially lifting them out of chronic loneliness and depression. A full photo gallery of the evening can be found over on our Facebook page. To see all the latest news and articles, visit our blog page here.